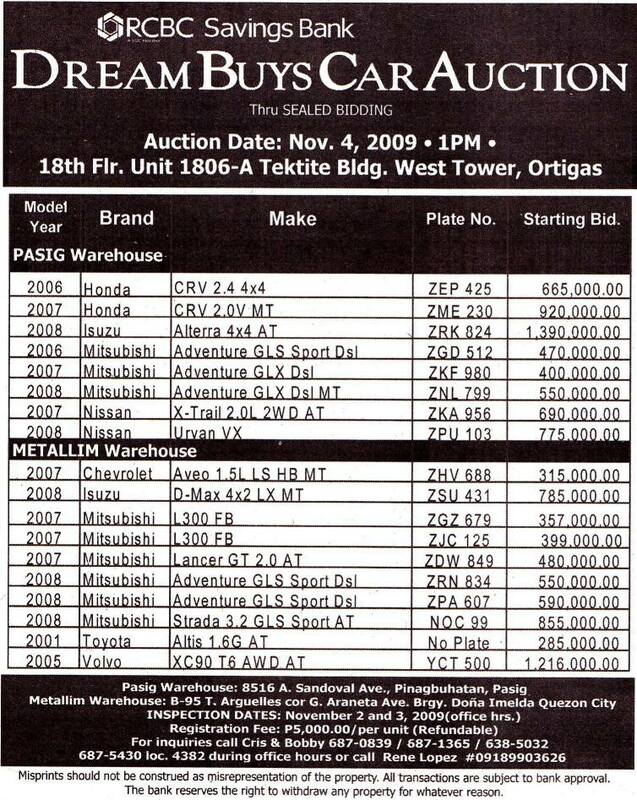 RCBC Savings Bank shall be having another Dream Buys Car Auction of repossessed cars on November 4, 2009, 1:00PM, at the 18th Floor, Unit 1806-A Tektite Bldg. West Tower, Ortigas. The auction of the various bank repossessed cars shall be done through sealed bidding. Inspection of the foreclosed cars can be done at the Pasig Warehouse located at 8516 A. Sandoval Ave., Pinagbuhatan, Pasig City and at the Metallim warehouse located at B-95 T. Arguelles cor. G. Araneta Ave. Brgy. Dona Imelda, Quezon City. Inspection dates are on November 2 and 3, 2009, during office hours. 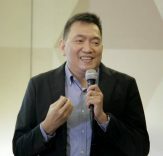 Interested bidders are required to bring a registration fee of Php5,000.00 per unit. The registration fee is refundable. For inquiries please call Cris and Bobby though telephone numbers 687-0839 / 687-1365 / 638-5032 / 687-5430 loc. 4382 during office hours or call Rene Lopez at 0918-9903626. Here’s a tip, if you’re concerned if any of the foreclosed cars have been flooded and were just cleaned up, all you have to do is get in the car and close all the doors and windows and smell the interior. If the car has indeed been flooded, you will smell it. How do I know this? My sister’s car that got flooded during Ondoy’s visit was already fixed and had already undergone detailing but the distinct smell of flood waters was still apparent. According to the service advisor from the casa, it is normal for the smell to persist for sometime even though detailing was already done for flooded cars. I guess only time will tell when the “flood water” smell would finally disappear. 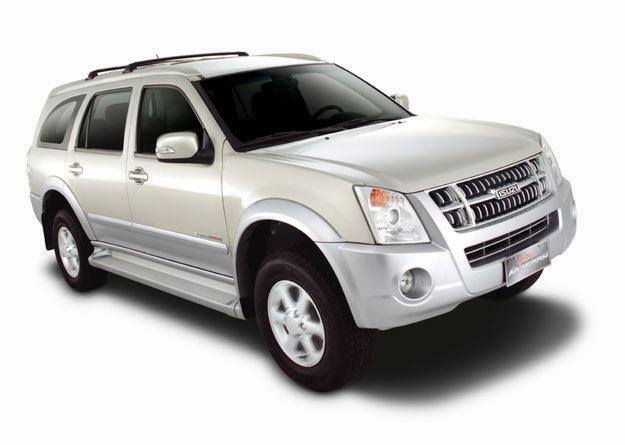 Back to the list of repossessed cars, I can’t help but feel that some of the foreclosed cars on the list appear to be quite expensive, especially the 2008 Isuzu Alterra 4×4 which has a higher starting bid than the 2005 Volvo XC90. Good luck anyway. Just click on the image below to zoom in and download the list of foreclosed cars for sale. Previous PostCar got flooded? 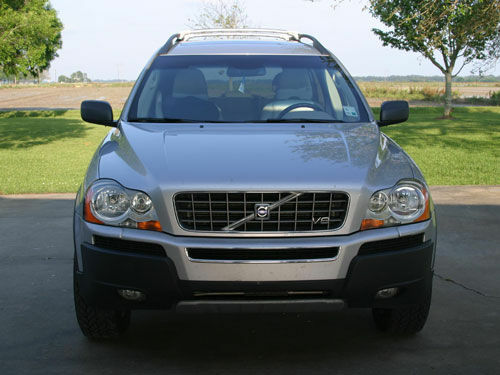 Why not consider looking at these bank repossessed cars for sale?